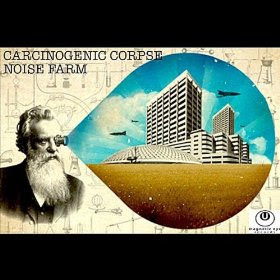 Heavy Planet : Album Review: Carcinogenic Corpse - "Noise Farm"
Album Review: Carcinogenic Corpse - "Noise Farm"
With a name like Carcinogenic Corpse, you'd expect this album to be splitting at the seams with heaviness. You'd be accurate in such a blanketed statement, but not how you'd anticipate. On Noise Farm, Carcinogenic Corpse wrestle with an atmosphere this planet doesn't know, cut off a thick slice for everyone to share, and glaze it with enough aberrant sound to make sure your hunger pangs never return. There's so much going on here, and one listen simply won't suffice. After a half-dozen spins, I still can't say I'm confident I'll ever stop finding new and wondrous elements sprinkled throughout these eight tracks. Noise Farm isn't likely to fit into your collection between Cannibal Corpse and Crowbar. Not even close. In fact, you'd be better off placing it amongst Hybrid, Yo La Tengo, and Aphex Twin. I can't surmise where Mike Vitali (yes, of Ironweed!) finds these sounds or how he manipulates them to grow into the album's resulting soundscapes, but I'm not gonna waste time questioning anything on this disc. Summer Girl lines a rope of spacey fuzz that lingers, hovers, and grabs you by the mind rather than the balls. The pensive crackling and drum-dusting evolves into surging tempos that perfectly balance with hollow quasar bounce. It's hard to think a track without vocals could get you to think this much. Before I get too far into trying to dissect this sonic amalgam, I should point out the fuzz doesn't end with Summer Girl. Bees buzz on The Charm, a creepy crawl through an abandoned mansion echoing layered vocals that embrace the contemporary while remaining haunting (Brent Hinds with no scowl, perhaps?). Drum loops click just enough to keep listeners twitching and swatting at pests that may or may not even be real. A fizzy shot of rumble breaks, returns, and provides warmth for your midnight walk home. Guitars drift on Light Yourself a Fire, though a grinding bounce and lyrics like "swallow their hearts" remind you there's too much substance and gravity here for the song to be swept off. The vocal effect is gnarly, forcing out all other sounds for just a few seconds until blips, loops, and wheat-field fretwork lays us down. To Our Surprise follows, sprinkling the grind with a hint of club-stomp. Lumbering, chewy, and factory-driven, the song rolls through incredibly beautiful imagery while still serving as the album's dirtiest chapter. Vult Decipi doesn't warrant a linear explanation of sounds. The song, fairly or unfairly, moves from fully-realized guitar intentions to cruise-ship dinner-party comfort to a fat cat in a far corner plucking a cello to a piano player having a drink thrown in his face to parlor games and parlor fights to something spooky and unidentifiable. I suppose you'll have to hear this one yourself. Rocco DiDonna's contributions are most evident on the gorgeous, airy Sōng Shān (Super High). You can't help but wonder what was lost, what he's trying to get back, and if his muse will answer when he asks "Can we laugh ourselves to sleep?" The backing ohms and ahhs only elevate an already heavenly song, while cautious drums and negatively charged ions crumble and let the buzz sink. What follows, and what proved to be the album's best track, is the industrial chain-link Battle on the Hill. Drums pop and lock, keys get spooky, and the guitar trips and bounces before a rocket fails to launch on more than one occasion. The strings soon visit the Far East, though they get a tad flirtatious with warbling fuzz. The album's closer is the hollow, English sidewalk-toned Down to the Bone. The groove is slow, calm, and loaded with an unidentifiable nostalgia. Something here screamed Sneaker Pimps, but acute descriptions won't ring true. It's too bad the album has to end here, given the inviting nature of the track. The electro-tread gets only slightly heavier on its march out the door, all while you feel like you just might be at a violin recital during the Abe Lincoln administration. There are so many sounds on Noise Farm, its hard to imagine they'd come together this well. From time-warps to space-warps, factories to nurseries, it seems like Carcinogenic Corpse have covered just about everything here. I can't imagine how much fun this album was to create. What'll really give listeners a kick, though, is how much fun it is to hear. Over and over. Again and again. There's something new every time. Facebook | Myspace | BUY IT HERE!